The Brisben Center was the recipient of some hardworking Marines this week. Members from Quantico visited the Center and completed several very important projects, most importantly, getting the facility ready for our new washers and dryers from the Washington Redskins. They also organized several areas, including a very cluttered shed and braved the cold to organize the freezer, the best we have seen it in years. Thank you to these wonderful volunteers! SEMPER FI!!! During the month of July, MidSouth Building Supply, Inc. conducted a donation drive of much needed supplies for the Brisben Center. Thanks to Angie and everyone at MidSouth, the drive was a success! Thank you Midsouth!! Ebenezer Baptist Church, led by Ms. Laverne, visited the Brisben Center last Saturday and brought every child a new book bag filled with school supplies. The children had fun picking out the brand new book bags and the parents were very grateful! Thank you Ebenezer!! Michelle Wilson Realty Group held a back to school party for the children yesterday. The children not only received all the necessary schools supplies but each child also received a brand new pair of Nike sneakers! Our heartfelt thanks to Michelle Wilson and her entire team! Nina’s Boutique recruited some talented volunteers to decorate the Brisben Center for the Fall last Saturday. The residents and staff love the decorations and are very grateful. Thank you Nina’s Boutique!! The Obenhein family blessed the Brisben Center this week when they prepared and served dinner for the residents and guests. It was a great family effort and the residents loved the summer themed menu of hamburgers and all the wonderful salads. The PSI PSI Omega chapter returned to the Brisben Center recently and prepared a wonderful meal for the residents on a very busy night here. The group also brought supplies for us to help the residents transition back into permanent housing. Thank you Liz and PSI PSI Omega!! 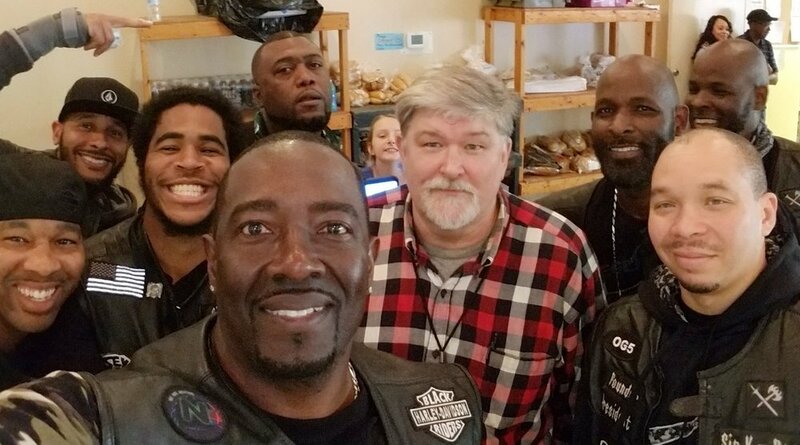 Volunteer Coordinator Joe Hargrove, Resource Officer Chris Payton and his wife Susan, vounteered at Riverclub Church, for its Rise against Hunger program. They helped stuff 50,000 bags of food for poverty-stricken children throughout the world. Chef Flavia Duran, a recent culinary school graduate, wanted to share her expertise with the Brisben Center. She, her husband, Michael, and daughter, Linda Consuelo, prepared a Mexican themed lunch—from scratch! This youth group took Brisben’s children outside for a recent Saturday of fun & games. Led by newly ordained pastor and youth leader Mark Hertenstein, the group played outdoor games with Brisben’s enthusiastic residents, and enjoyed some ice cream snacks. Dana Brown of Lifepoint Church- Fredericksburg campus presented a check to Brisben’s Volunteer Coordinator Joe Hargrove. The funds will help with residents’ prescription medications. This group brought several different crafts to the Brisben Center to share on a Sunday with Brisben’s resident children. They also had a book center for the children to read and choose a book to keep. 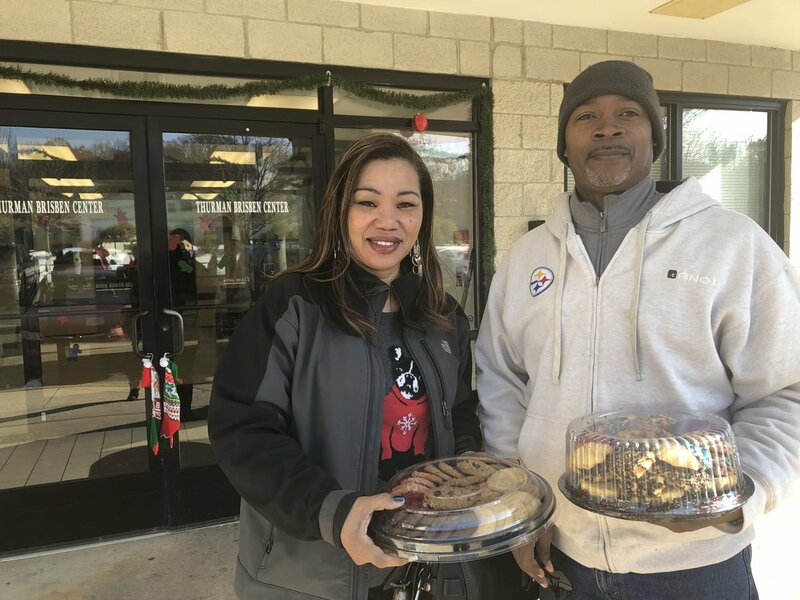 Company employees prepared and served two separate, delicious lunches; and showed their generosity by making a financial donation to the Center! This group delivered much needed supplies for Brisben residents and facility. They collected throughout the community, including in front of Shoppers Food Warehouse in Stafford. They also took a tour of the Center and asked a lot of great questions. 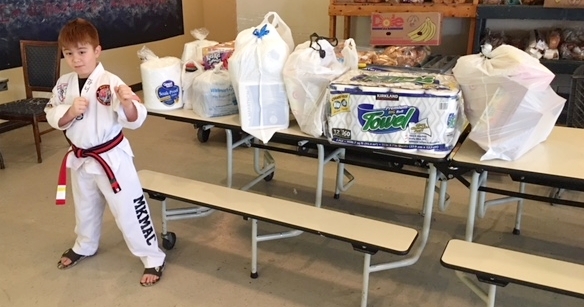 Conner collected and donated supplies as part of his work toward earning a black belt in Tae Kwon Do! Pastor Chris and members of his congregation held a donation drive for supplies, including eight cases of water. With baseball just around the corner, church volunteers stepped up to the plate and hit a grand slam for the Center! Not only did they cook a meal -- they then prepared side dishes for the next night, as we had a rare last minute cancellation. Matt Mitchel presented a check from Kiwanis to the Brisben Center. Kiwanis is Brisben's newest Community Partner. Receiving the check are Brisben's Volunteer Coordinator Joe Hargrove and Resource Development Officer Chris Payton. The fraternity recently honored The Brisben Center with its Community Service Award for 2017. Ashley took time out of her busy schedule to spend time with our resident children recently. She donated children's shoes and read to the children -- and some enjoyed trying on her crown and sash! The Strettons volunteered recently organizing and folding bags of donated clothes. Pictured are Trisha, her husband, Chris, and daughters, Sophia and Emma. What a great family project! Alpha Phi Alpha recently presented The Brisben Center with its prestigious Community Service Award for 2017. Brisben's Volunteer Coordinator Joe Hargrove accepted the award on behalf of Brisben. Hargrove thanked the fraternity for all they do for our community. Its mission statement is: Alpha Phi Alpha Fraternity, Inc. develops leaders, promotes brotherhood and academic excellence, while providing service and advocacy for our communities. The Brisben Center is honored to be recognized by this outstanding organization! Welcome New Community Partner -- Kiwanis of Fredericksburg! Matt Mitchel (center) presents a check to Brisben's Joe Hargrove (left) and Chris Payton. 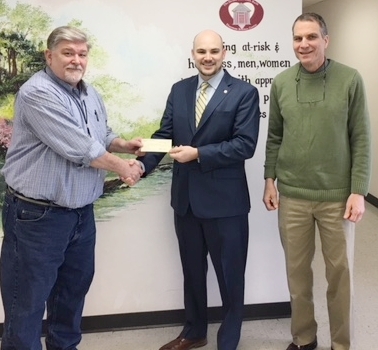 Matt Mitchel, representing the Board of Directors for Kiwanis of Fredericksburg, presented a check to the Brisben Center in recognition of the work the Center does with children. The Kiwanis is “dedicated to changing the world one child and one community at a time” and recognizes the many children and their families Brisben has assisted in their journey in returning to permanent housing. The Brisben Center is proud to announce the Kiwanis as its newest Community Partner! The Thurman Brisben Center Executive Board of Directors welcomes N. David Cooper as the new executive director of the Center. The Center is the greater community’s 80-bed residential emergency homeless shelter operating 24-hours a day/365 days a year. Cooper assumed his duties on Monday, January 2.
Cooper brings an extensive array of experience and training in organizational leadership, community development, and construction project management. He has informed, inspired, equipped, led, coached and consulted with non-profit agencies, businesses, congregations, universities, community groups and individuals to coalesce partners for discovering, mapping and linking resources that achieve community-inspired, community-developed and community-resourced results. He focuses on ending homelessness, resolving poverty, developing community-affordable housing, and improving food security. Building on a successful career in heavy construction project management, Cooper earned multidisciplinary graduate degrees that include Master of Social Work in human services administration, policy and programs, Master of Divinity in pastoral leadership, and graduate Certificate in Public (non-profit) Management. Cooper has served on the Richmond Continuum of Care for coordination of homeless services, Virginia Prisoner Reentry Policy Academy housing workgroups, and he has advocated in the White House, the U.S. Congress and Virginia General Assembly. Cooper enjoys family, fishing, hiking and reading; and, he is very excited to participate with our community in Together—Building a Better Brisben toward ending homelessness in Planning District 16. Kim Lally will continue her outstanding service to Brisben as deputy director/chief operating officer. Past executive director and resource officer, Roger Trott, and his wife, Terry, intend to stay active in donating, fundraising and volunteering on behalf of Brisben. You may reach David Cooper at 540-899-9853 or dcooper@brisbencenter.org. Happy Holidays from Brisben! Thank you to all of our wonderful volunteers! Ms. Elaine and Ms. Joanne, from Union Bell Baptist Church, brought a supply of bath towels and washcloths that they collected from their congregation. The sales department came with their chef hats on and cooked a delicious Italian style meal for the residents and staff. The group also organized some donation rooms and our pantry. Troop members raised their hands in victory for the large supply of winter wear they collected for Brisben residents -- mittens, gloves scarves, hats and coats from toddler sizes up to men's XXL. Church volunteers provided a favorite lunch of grilled hot dogs, french fries and baked beans. The mid-week lunch was a rare treat! Raven Turner, family and consumer science teacher, returned again this year with handmade items from her students -- pillows, stuffed animals and handmade Christmas cards for resident children. The church helped Santa with the delivery of a truck full of presents for Brisben's resident children -- delivered by by Pastor Ryan. Erika and Patsy from ServPro delivered coats, mittens, gloves, scarves and hats collected during a company winter apparel drive. Employees purchased and assembled special gift bags for every adult Brisben resident. the group was led by Gina and supported by owner Randy Harris. 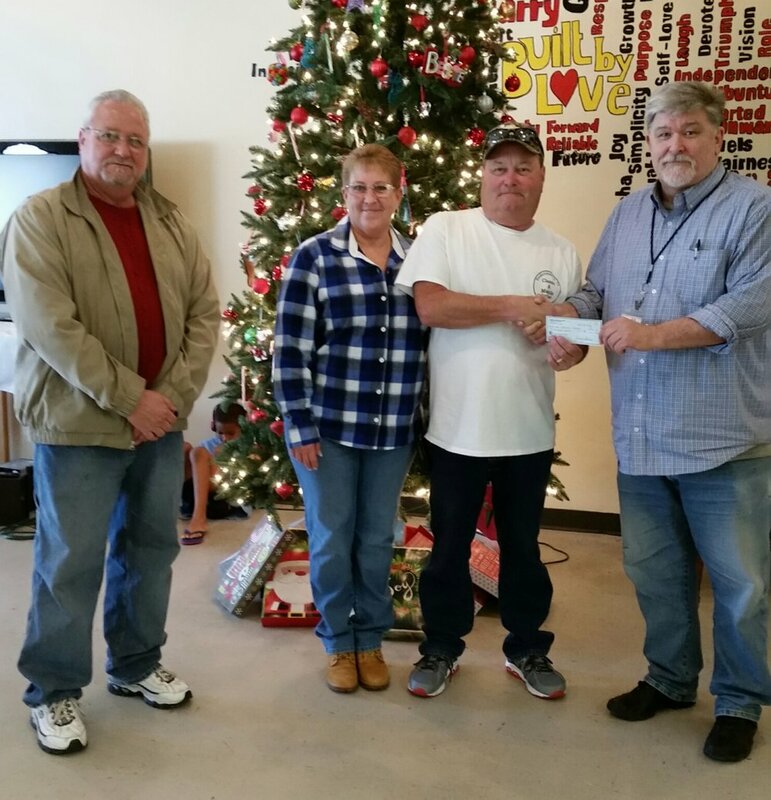 Rick Sinclair, Kim Sinclair, and Bruce Wheeler from the Fredericksburg Classic Muscle Car Club presented a large check for Brisben's Holiday Matching Fund drive. 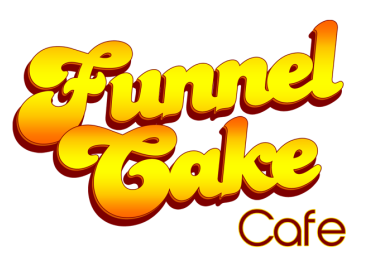 The Brisben Center welcomes the Funnel Cake Café as a new Community Partner and a donor of matching funds for the holiday fund drive! This mobile café is based in Locust Grove and serves an array of funnel cakes for every taste! Made from scratch from start to finish ... the end result is simply delicious! Contact Funnel Cake Café at (540) 538-2743 or visit the website. We are thankful for all of our volunteers at Brisben and we want to show them off! Beginning today, we regularly will post a slideshow of MANY of the wonderful volunteers who come to Brisben to work, or serve food, or drop off supplies, or entertain Brisben residents. Please join us in acknowledging these generous and big-hearted people! Volunteers from Hilldrup visited the Brisben Center recently, providing lunch for residents and performing service projects around the facility. Club members came to Brisben in early November to serve breakfast to Brisben residents. The motorcycle club roared into Brisben's parking lot with a large donation of much needed supplies. After putting the supplies away, the group showed their motorcycles to Brisben's children. After putting donated supplies away, the club showed their motorcycles to Brisben's children. This group recently conducted a donation drive for the Brisben Center -- collecting coats, hoodies, sweatshirts, hand warmers and other cold weather items much needed this time of the year. This Stafford company volunteered at the Brisben Center for its Community Outreach program. The volunteers handled some major chores: organizing the supply closets, including folding and sizing of donated clothes; cleaning the ceiling vents; and preparing and serving a picnic-style lunch with fried chicken and wings. Tim Scott of the New York Giants helped support a donation drive sponsored by his high school friend, Clyde. The drive, held at Cowboy Jacks restaurant, brought in supplies and more than 40 new coats for residents. These two members of Mary Washington University sorority Zeta Omega Delta brought donations from the sorority using proceeds from a bake sale. They brought 200 Fred Bus tickets and Halloween goody bags for the children. Many residents struggle with transportation so the tickets were much needed. Ishaan, pictured here with his father Bhauin, decided to celebrate his 12th birthday by bringing much needed donations to the Brisben Center. We are very grateful for the birthday presents Ishaan gave our residents! Noah and Boy Scout Troop 26 conducted a successful donation drive to benefit the Brisben Center! Supported by his parents and Scout leader Joe, Noah and his fellow Scouts set up outside the new Wal-Mart on 610 in Stafford and collected items all day long on a recent Saturday. Noah coordinated and executed the entire project to help him become an Eagle Scout. Thank you to Noah and all that participated with the Boy Scouts.